Verbatim’s Wireless Desktop Laser Mouse is a good wireless mouse for people who prefer to use the 2.4GHz wireless spectrum with a USB receiver connected to their Mac instead of Bluetooth. The mouse’s almost symmetrical design allows it to be used with either the left or right hand. There's a pair of buttons along the left side that you can press using the thumb on your right hand. Users who mouse with their left hand press these two buttons with the ring finger or pinkie. The mouse has five buttons: the aforementioned buttons on the left side, the left and right click buttons, and a scroll wheel button. All buttons can be programmed using Verbatim’s software, which appears in the Other section of System Preferences. You can assign any of the buttons to F-key functions, Dashboard, Exposé, Cut, Copy, Paste, and more. Of course, you can also use the standard Mac Keyboard & Mouse preferences if you prefer. The left and right click buttons take a little more effort to press than with other mice I’ve used. Although I didn't experience any fatigue or soreness, clicking and dragging was more of an effort than it should be. The scroll wheel has a gently notched feel when you roll it up or down. You can also nudge the wheel left or right to scroll horizontally. The scroll wheel isn’t as freewheeling as the omnidirectional scroll ball on Apple’s Mighty Mouse ( ), but whether that's a pro or a con is a matter of personal preference. The mouse fit my hand well (I wear a men’s size large glove); it didn’t feel too small and cramped or too big. The mouse itself is made of hard plastic with a rubberized grip that gives it a slightly cheap look and feel, but it held up well during the two weeks I used it. If you like to change the tracking speed based on the software you’re using, you’ll find the mouse’s ability to instantly switch tracking speed very helpful. On top of the mouse is a diamond-shaped button that lets you switch between three tracking speeds. To indicate which one you’re using, the button lights up; the brightest light means tracking is on the fastest speed, no light means it’s on the slowest speed, and a medium-bright light means the mouse is set to the middle speed. Verbatim’s software enables you to customize the functions for each mouse button. Unfortunately, there’s no battery life indicator to tell you when the AAs inside the mouse need to be replaced (Verbatim includes a pair of alkaline AA batteries). The included USB receiver is about the size of a USB flash drive. I didn’t experience any signal dropouts during my testing, and I was able to use the mouse without any problems. You can always use the On-Off button to preserve battery life. 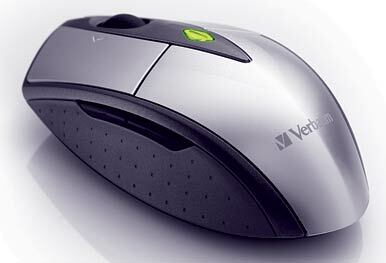 Verbatim’s Wireless Desktop Laser Mouse is a serviceable mouse. Its buttons are easily programmable and you can switch tracking speeds on-the-fly, though some people may not like the feel of the buttons or the hard plastic case.